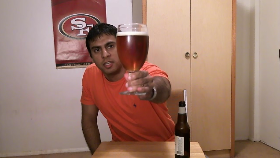 Dogfish Head Punkin Ale is the second pumpkin ale that I've reviewed this year. My first review of this style was on Weyerbacher Imperial Pumpkin Ale. For the most part, I enjoyed Weyerbacher's version; however, I was hoping for a little less spice and a lot more pumpkin. This is Dogfish Head's best selling seasonal beer. You can find it in 22 states from September to November. Gets you in the fall mood. This poured a beautiful orange, honey-like color. The body was very clear with moderate carbonation. The one figure head was light brown that vanished pretty quickly. A mellow smelling pumpkin ale. The nose on this was very mellowed out. I got hints of pumpkin, cinnamon and nutmeg. Unlike in the Weyerbacher, the pumpkin smell dominated the cinnamon. The taste is where Dogfish Head separates itself from Weyerbacher. The organic brown sugar which isn't part of the Weyerbacher recipe, blended well with the spices and carbonation. You got a smooth spice taste in the front, followed by a nice pumpkin flavor in the back. 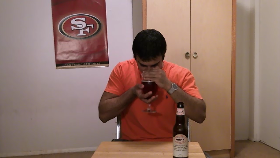 The mild carbonation combined with the oily texture enhanced the taste of the cinnamon and pumpkin. I personally liked this one more than Weyerbacher's pumpkin ale. The taste was a lot more balanced with the pumpkin and spices. 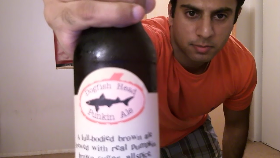 I'm more likely to pick up a four pack of Dogfish Head Punkin Ale due to its drinkability. If you have tried both, then tell me which one you like better. 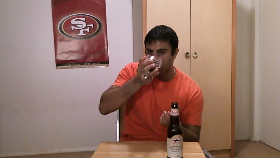 Check Out Another Dogfish Head Review!